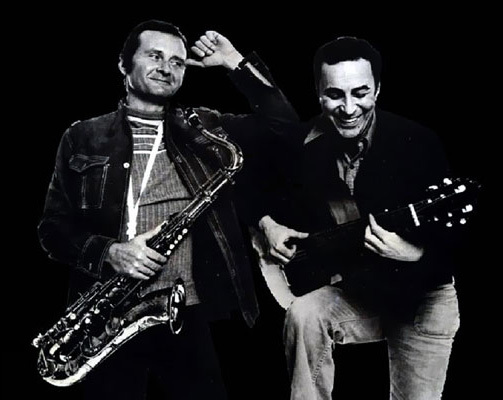 Stan Getz was already a successful jazz saxophone player when, in 1962, Charlie Byrd’s search for a horn with a human voice prompted him to record Antônio Carlos Jobim’s Desafinado. The recording was such a surprise hit that Getz decided to pursue Brazilian music further, particularly examples of the new bossa nova genre. His subsequent recording of Jobim’s Garota de Ipanema (Girl from Ipanema) became his biggest success, spearheading a brief but notable enthusiasm for Brazilian styles among international audiences. Getz’s breathy, smooth sound and the delicate floating effect that he created proved widely popular beyond the jazz world. This according to “Getz, Stan” by Jeff Kaliss (Encyclopedia of music in the 20th century [New York: Routledge, 2013] p. 247); this resource is one of many included in RILM music encyclopedias, an ever-expanding full-text compilation of reference works. Today would have been Getz’s 90th birthday! Above, with João Gilberto in the early 1960s; below, his signature numbers in 1983.